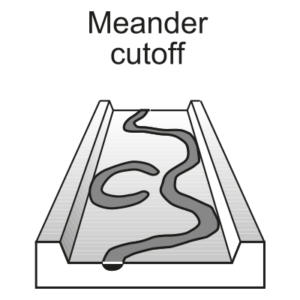 A meander bend that has been cut through the neck, leaving an abandoned meander loop on the floodplain. The bends have an arcuate or sinuous planform (generally one meander loop). Generally horseshoe or semi circular in planview, reflecting the morphology of the former channel bend. May host standing water (i.e. ox bow lake or billabong) or be infilled with fine grained materials. Associated with channel adjustment in meandering streams. Formed by the channel breaching the meander bend (possibly linked to flow obstruction upstream) or through the development of a neck cutoff during high flow conditions. Represent shortening of stream lengths or decreases in sinuosity of the channel, steepening the water-slope at flood stage. The palaeo-meander loop subsequently becomes plugged with instream materials, with the abandoned meander gradually becoming isolated from the main channel. The loop may infill with fine-grained, suspended load materials and develop into a billabong. These features record the palaeo-planform and geometry of the channel.